Has your roof started to show signs of needing replacement? Maybe you’ve noticed a roof leak on your roof that needs to be repaired. At Livingston Roof Pros we offer roof repair in Howell Michigan and if your entire roof needs to be replaced we also offer installation of a new roof in Howell Michigan. We are a fully licensed and insured roofing contractor in Howell Michigan and our customer service is second to none. Be sure to call us today to get a free roof estimate on your next roofing project in Howell Michigan. Getting a new roof on your home may seem like a time intensive project that will take weeks. However, at Livingston Roof Pros we can install a new roof on your home in as little as one day for most homes. We have qualified roofing experts who are ready to assist you in your roofing needs. We offer roof repair and roof replacement in Howell Michigan. We have been a part of this community for many years and we continue to offer excellent customer service and our guarantee backed roofing services in Howell Michigan. At Livingston Roof Pros we realize that without our customers, our business would simply not exist. We do everything we possibly can to ensure that each and every one of customers is completely satisfied with the work they are provided. In fact, we have been voted the number one roofing contractor in customer service for many years. We always strive to provide the best customer service available because we don’t just want to be your roofing contractor today but we want to be the roofing contractor for years to come. One of the joys of living in Michigan is the weather can be absolutely amazing and extreme at the same time. The spring and summers bring us the scorching heat while the freeze of winter and snow can seem never ending. For roofing contractors this can pose a problem. Many roofing contractors will install new roofs during the warmer months when the temperatures raise above 40 degrees Fahrenheit. This allows for a better seal for the roofing that is added to your home. The problem however is that many of the roofing contractors are backed up with work during this warmer weather. Some roofing contractors will take on more work and not have the man power to actually do the project and it may be weeks before your roof is installed. At Livingston Roof Pros however we have a team of professionals who are ready to install your new roof quickly and efficiently. When we give you an estimate on your roofing project we’ll also include a time frame for when the roof can be installed. Our team of qualified roofing professionals can usually install a new roof in one or two days depending on the size of the home and other factors. In either case, we’ll let you know just when your roof can be installed and how much it will be. Roofing materials today are sold with extended warranties. These warranties can be as much as 50 years and in some cases longer. However, the roofing materials need to be installed by properly qualified professionals or the roofing warranty may be void. 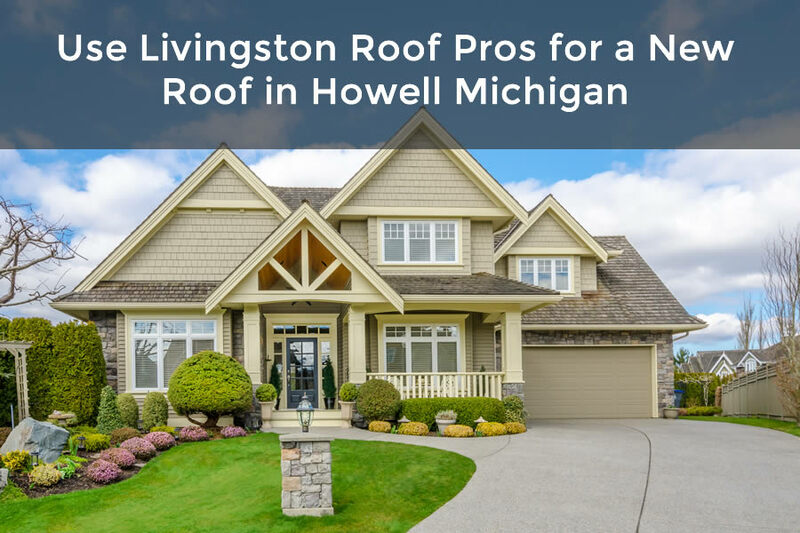 At Livingston Roof Pros we are fully licensed and insured roofing contractors in Howell Michigan that are fully qualified to install many of the top roofing materials that are sold today. Don’t trust your home’s roof to inexperienced roofers. At Livingston Roof Pros we have a full staff of professionals who have been in the roofing business for many years. In fact, we have more than 5 decades of combined experience on each one of our roofing teams.